Just Listed :: Adorable Townhome in Great Marietta Community! 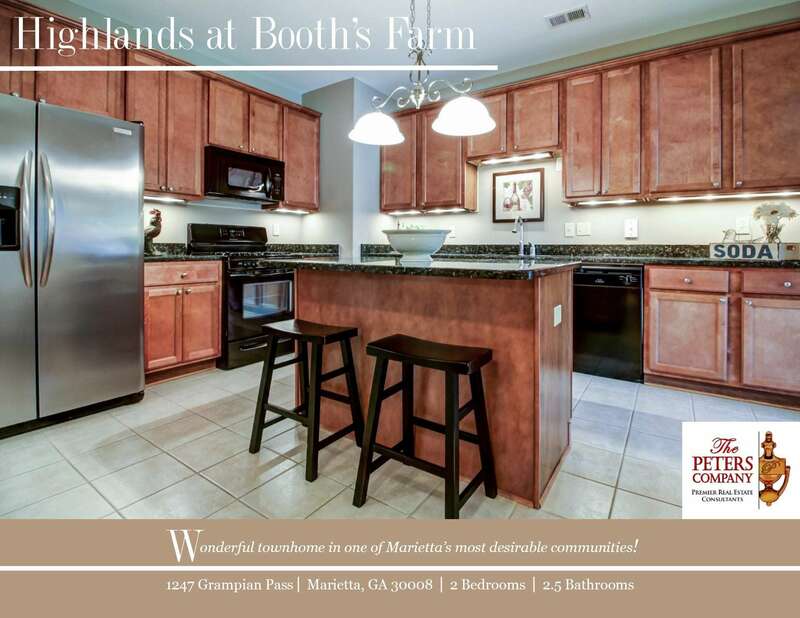 Welcome home to this wonderful townhome located on a quiet cul-de-sac street in the popular Highlands at Booth’s Farm neighborhood. The floor plan, custom features, and charming character of this home will never go out of style. The close proximity to Delk Road, I-75, and I-285 make it convenient to and from any direction. Being in this booming area of Marietta means you can enjoy many nearby restaurants and shopping spots! · Kitchen features granite countertops, under cabinet lighting, large pantry, and island with breakfast bar. · The main living area is accented by gleaming hardwood floors, and includes a nice combination of living room and dining area which are perfect for entertaining. · The spacious living room has a cozy gas fireplace. Plenty of natural light pours into the space from a large wall of windows. · Master suite is a true retreat complete with a trey ceiling, huge walk-in closet, and spa-like master bath with a double vanity, garden tub, and separate shower. · Additional bedroom is well-sized and bright. It’s truly a second master suite complete with trey ceiling, large walk-in closet, and private bath. · A spacious loft/landing space upstairs is ideal for a home office. · Laundry conveniently located upstairs. · The large patio is great for outdoor enjoyment. Designated greenspace out back means nothing will be built behind you, providing guaranteed privacy! · Wonderful community amenities include a well-maintained pool and gated access. ← Just Listed :: Corner Unit Condo in Buckhead's Eclipse!